Well for Dad's Birthday Mom wanted to do something a little different. So she called up Venetian to get some tickets to Blue and found out that they were 2 for 1 so Mom invite Julie and I. This is the second date Julie and I have been and I think it is starting to get kind of serious. Last week I got a few tickets to Phantom of the Opera at Venetian from a client and brought Julie with me....it was kind of a sleeper, but the BLUE Man Group was AWESOME!!! 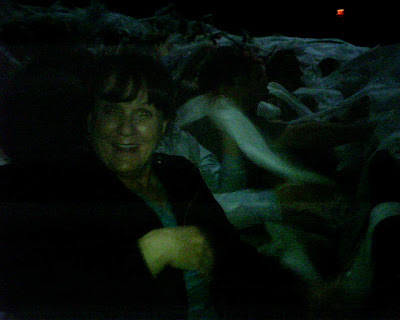 At the very end of the show they have this paper that gets thrown at you from the back and you have to pull it all over your head until it gets to the front and this is how Mom was reacting to it....fun stuff. The best I could do with a camera phone. Sweet photo Michael!!! Mom told me you all went out and it was "interesting". Wish I could have gone to the "interesting" show with you. Also, you never told me you were dating Julie! And it's serious too? Wow! Guess holidays will be easy to work out with which family to go visit huh? Is this the first time you've been to Blue Man Group? We went in Chicago and the TP part was one of the most memorable for me. Glad you had fun! P.S. Don't you think it's time to to a collage of favorite Sherie photos? I loved this one! She is hilarious.